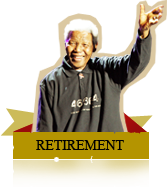 Rolihlahla Dalibhunga Mandela is born a member of the Madiba clan in Mvezo, a rural village near Mthatha in the Transkei. 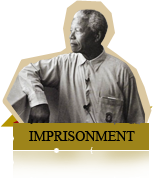 His father is dispossessed of his land and money on the orders of a white magistrate because of ‘insubordination'. The family move from their ancestral kraal in Mvezo to the nearby village of Qunu. 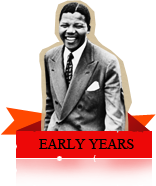 Becomes the first member of his family to attend school - at a primary school near Qunu. A teacher wants all children to have a Christian name so dubs him ‘Nelson’. His father dies. The acting chief of the Thembu clan, Jongintaba Dalindyebo becomes his guardian and ensures he receives an excellent education. Undergoes traditional initiation rites to become a man. Later goes to Clarkebury Boarding Institute in Engcobo. Moves to Healdtown, to attend the Wesleyan college in Fort Beaufort. 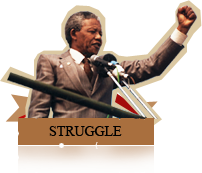 Enrolls at the University College of Fort Hare, in Alice where he studies for a BA and meets his lifelong friend Oliver Tambo. Expelled from Fort Hare due to his involvement in a boycott by the Students' Representative Council against the university policies. Flees to Johannesburg to escape a marriage arranged for him by his guardian. Works briefly as a mine night watchman in Johannesburg while living in Alexandra, then works as a clerk at the law form Witkin, Sidelsky and Eidelman, doing his articles. 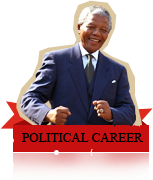 Completes his BA degree via a correspondence course at the University of South Africa (Unisa). Studies Law at the University of Witwatersrand whilst living in Alexandra; Joins the ANC; a nationalistic pro-democratic group.